This is Zach. 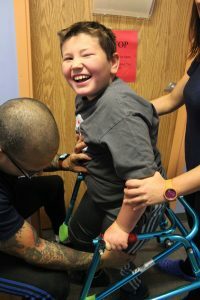 Like many of our clients, Zach has cerebral palsy. And, like many of our clients, Zach has made amazing advances towards independence and confidence at The Movement Centre. After a year on the waiting list, Zack started coming to The Movement Centre when he was 7 years old, in the fall of 2014. “We weren’t bringing Zach to The Movement Centre to walk and talk”, said Zach’s mom Janique. They were bringing him to be the best he could be – be in shape, weight bear, be as active as possible, communicate better, and give him as healthy a life as they could. Every milestone for Zach is a celebration. 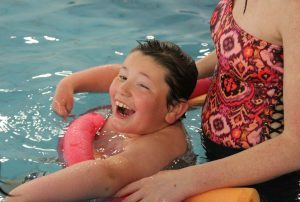 Within Zach’s first session at The Movement Centre, he learned toileting and feeding, things that his parents didn’t even know that he was going to be capable of! Over the years, Zach’s motor skills have improved. His left hand is much stronger than it was originally. He can take his own jacket off. He learned to drink out of a regular cup! He can weight bear, and during his sessions you’ll find him walking with a walker up and down the hall with a smile on his face! The Movement Centre gets him up and moving. “It’s so good for him to be up on his feet”, said his mom. Zach has an indomitable spirit. Rarely does the camera catch Zach when he isn’t smiling. That might be because, as his mom says, he’s a joyful boy. A sports lover, Zach loves to do commentary, and after every Jets game he interviews his family. Over the years, he has developed his own version of sign language to communicate. His family, close friends, and workers at The Movement Centre understand Zach, however new friends and acquaintances don’t know his unique brand of sign language. His current goal is to use his iPad to communicate more. Zach loves coming to The Movement Centre. Besides having class with his best friends, “he is normal at The Movement Centre”, said mom Janique. “At school everything needs to be modified for him, but when he comes to the Centre he doesn’t feel like things are altered for him – this place was made for him and kids like him”. 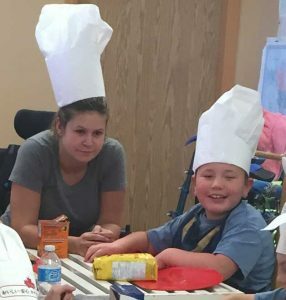 Zach is more confident and has stronger self-esteem since coming to The Movement Centre. In addition to the progress Zach has made, Janique said, “There has also been growth for me – the other moms are my rocks”. Just as the kids in Zach’s class are best friends, the mom’s are best friends as well. The sense of community, support, and family found inside and outside the classrooms of The Movement Centre.